We love to see your child smile! Welcome to Noonan, Brockman & Pollock D.D.S., Inc.
Did you know your child’s first dental visits set an attitude about seeing the dentist for the rest of his or her life? That’s why it’s essential for your son or daughter to have only positive, fun experiences at the dentist’s office. Dr. W. Patrick Noonan, Dr. Douglas J. Brockman, and Dr. Matthew P. Pollock are passionate about helping young patients achieve great oral health, and teaching them that a visit to the dentist can be fun. 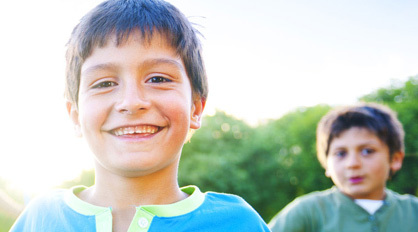 Our Middletown pediatric dental practice focuses on the unique needs of infants, children, and adolescents. Since they’re specialists in pediatric dentistry, Drs. Noonan, Brockman, and Pollock have received an additional two years of specialty training in pediatric dentistry after graduation from dental school. This enabled them to provide the level of care and attention your child deserves. Creating healthy teeth and great smiles for amazing children! Our focus is on developing a relationship of trust and confidence with each of our patients and the parents. We provide preventive services and educational resources as well as treatment of dental problems in order to help our patients have positive dental experiences and a lifetime of happy, healthy smiles. Each and every child deserves quality dental care in a safe and caring environment. At Noonan, Brockman & Pollock D.D.S., Inc., we strive to be a fun, friendly place that our patients enjoy coming to visit. Find out for yourself: Schedule an appointment for your little one at our Middletown pediatric dental office and get ready to see your child smile!